Power BI apps allow organizations to distribute a collection of purpose-built dashboards and reports to a large number of business users and empower them to make data-driven decisions. Since Power BI apps were launched in May, the response has been tremendous. 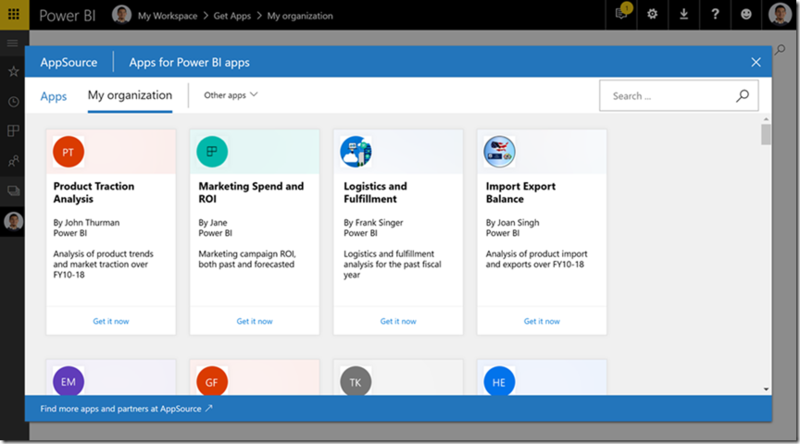 Thousands of apps have been created in Power BI since, and hundreds of thousands of users have used these apps as the primary way to consume Power BI content with ease. Today, we are taking it a step further and supercharging these apps by releasing one of the most requested features: selective publish of content. Consider this scenario: You created a Power BI app that your entire organization uses to get a 360-degree view of the sales pipeline and you are working on adding a new dashboard to the app that focuses on sales forecasts. Your end users request a minor improvement to an existing dashboard in the app. You would like to make that improvement and update the app without publishing the incomplete sales forecast dashboard. 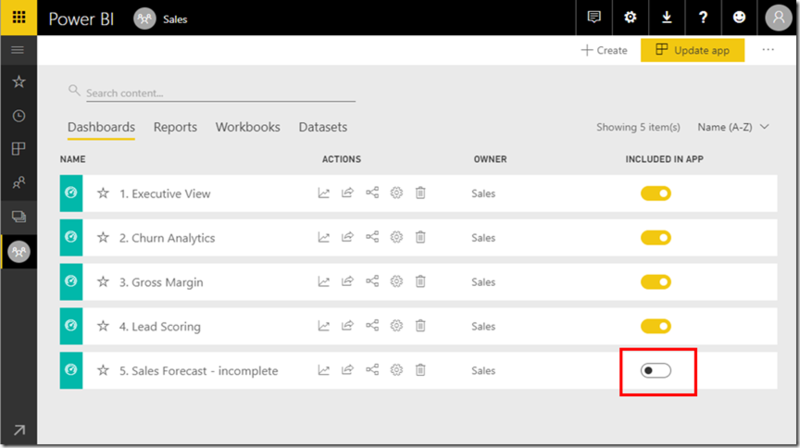 This was not possible until now – with every update of a Power BI app, all the content in the underlying app workspaces gets published. But with today’s release, you can choose not to publish certain dashboards and reports in the app workspace. In the picture below, I have an app workspace for Sales. I would like to make a small change to the Executive View dashboard and update the app. But I do not want my incomplete Sales Forecast dashboard to be published to my end users yet. We have added new functionality to the content list to do just that. I can just turn off the “Included in app” toggle for my Sales Forecast dashboard. I can then update the app, and my Sales Forecast dashboard will not be included in the app. Now I can make incremental updates to my app without publishing my incomplete dashboards or reports. More information on this functionality is available in our documentation. Continuing with our example above, there might come a situation where you want to share the sales app that you created to external users outside of your organization. 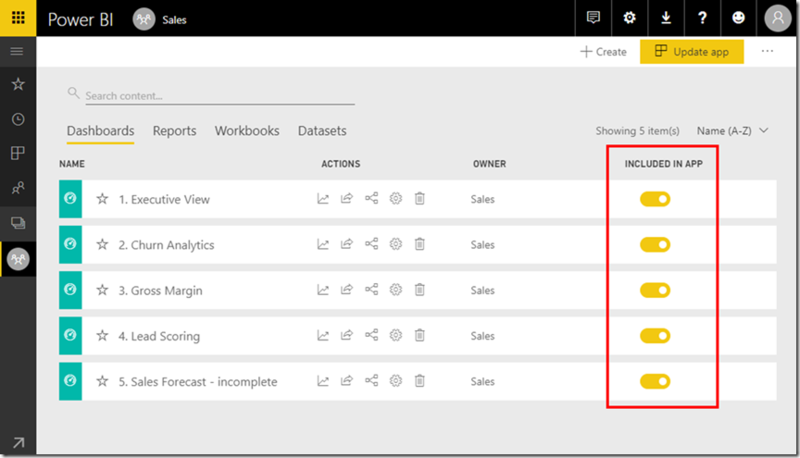 Thanks to Power BI’s integration with Azure Active Directory (AD) business-to-business (B2B), you can seamlessly distribute Power BI apps and dashboards to guest users while maintaining control over the internal data. Recipients will be able to access your content with their own organizational identity. Check out this announcement post for more details. You no longer have to experiment with the different icons on the on-tile actions for dashboard tiles! We have updated the on-hover experience to just contain the ellipses and when click on, you will see a more intuitive dropdown that describes the various actions that can be performed on that tile. Early October, we added support for e-mail subscriptions within Power BI Apps. With this feature, you can install any Power BI app, and then subscribe for email updates on any dashboard or report page contained within the app. 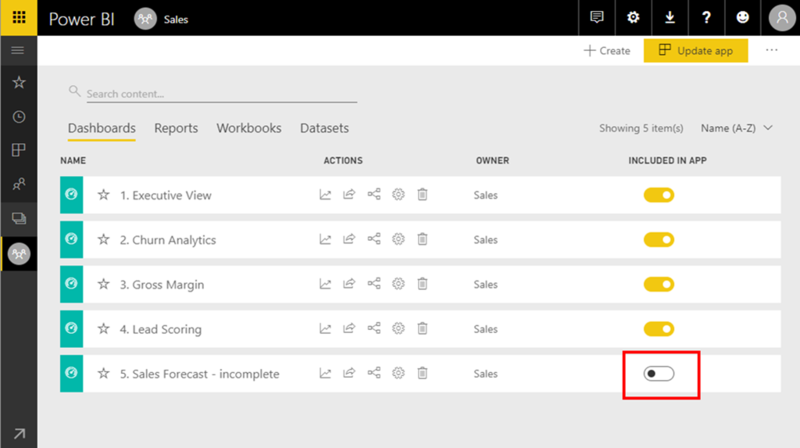 You will then be notified of any changes to the data right as it happens, multiplying the impact of your Power BI solutions. Don’t forget to check out the November 2017 update of the on-premises data gateway. This gateway release is filled with enhancements. You can now group multiple gateway instances together with High availability support, trace Mashup engine logs under “Additional logging”, connect to IBM Netezza via the gateway, automatically fall back to communicating through Azure Service Bus using HTTPS if direct TCP fails, and an updated version of the Mashup engine. Read about these changes, and more in the November's announcement post.